Slickrock has been approved by Vela Kitesurf Resorts as one of their sanctioned kitesurf centers. 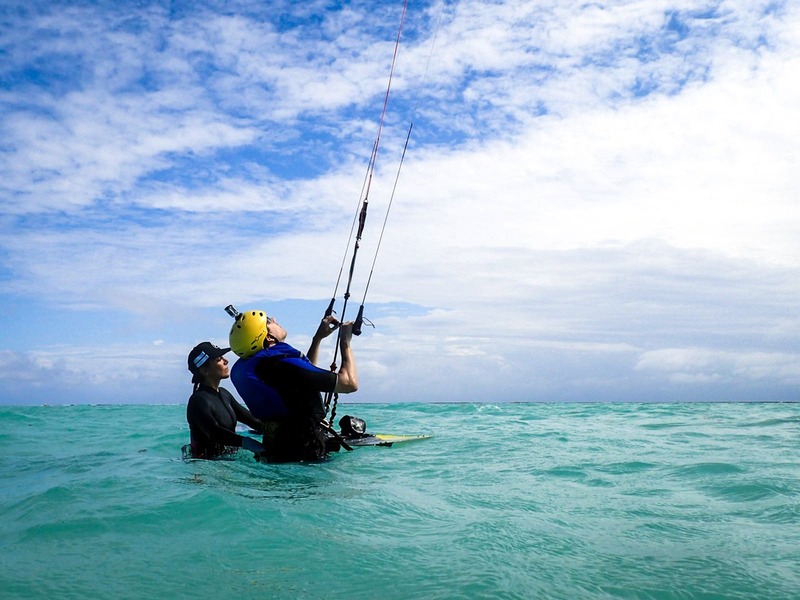 We offer the only kitesurfing lessons at Glover’s Atoll! Lessons are available December – March only. 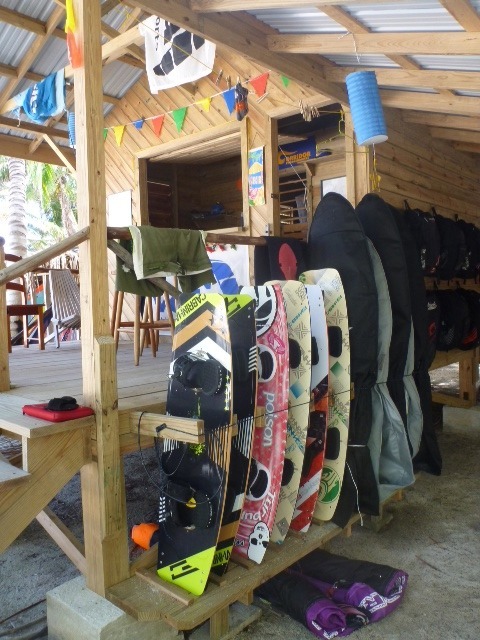 Kitesurfing at our island is not available unless you stay with us at our Belize caye resort. Our island is located far out to sea, which is one of the reasons it is such a fabulous place; we experience none of the crowding found in other parts of Belize. There is no way to visit our island only for the day, a 5-night package (3 nights on the island) is our minimum as our private boat charter only goes to and from the island two days a week. 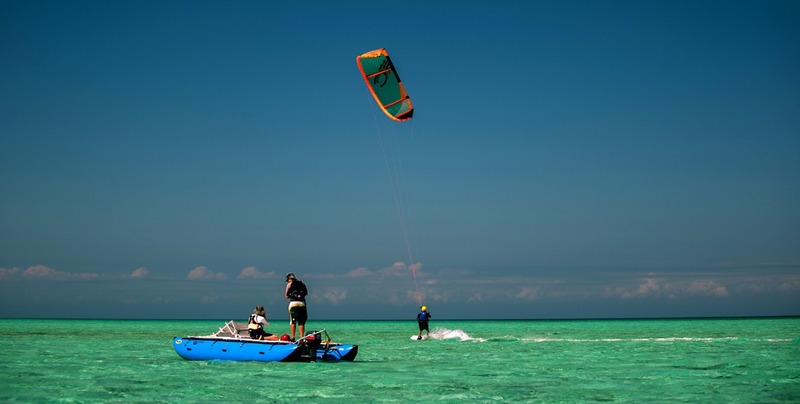 Kitesurf lessons are taught 2 miles away at a large, shallow area accessible by our special motorized raft. Lessons are not part of the package. Guests may take lessons throughout the week and the total is called into our office after the week is over. We will then charge the credit card we have on file. It is not possible to pay for lessons in advance, but you may “get in line” and reserve lessons so that you can get lots of kiting in on a busy week. 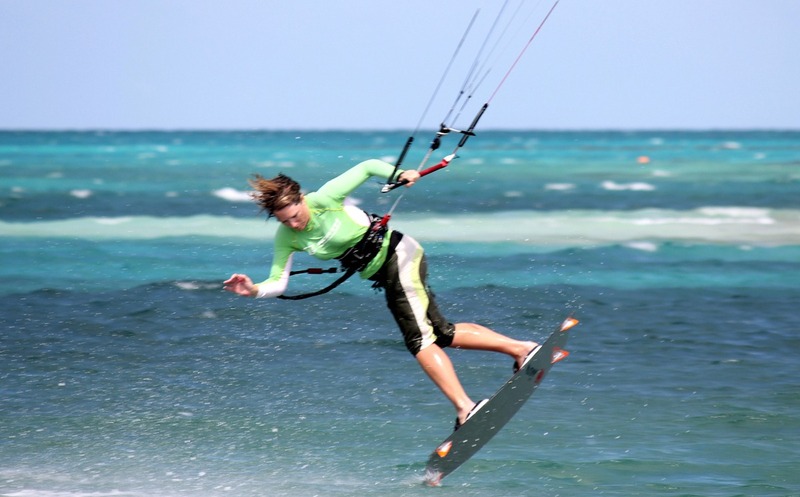 Each session lasts approximately three hours, including transport to and from the kitesurfing area which is out on a huge sand flat area about two miles from our island. The kite will be in the air approximately two hours per lesson. For two and three student lessons, this time will be split between all students. In addition to the prices listed below, there is a $15 per person per lesson equipment insurance fee. A progression of lessons cover skills such as basic kite control, body dragging, power strokes, board recovery, waterstart and upwind reaches. Lessons can be pre-booked or booked on the island. Pre-booking lessons, although not required, will ensure you get a spot and priority for lesson slots, which can fill up during larger trips. You don’t pay for your lessons until after your trip is completed. At the end of the week students sign an invoice so that they understand what the final amount will be. The total is later called in to our Utah office and your credit card on file is charged after your trip is over. Equipment insurance is required for students taking kiteboard lessons. Beginners are extremely tough on the gear, and although we expect normal wear and tear over time, we have seen students destroy brand new, $1,000 kites in a single session. Rather than ask students to accept complete liability for the gear if they ruin it, we use an insurance fee to spread the risk in the event of major damage. Fees are $15 per student for each lesson, regardless of how many students are on a particular lesson. 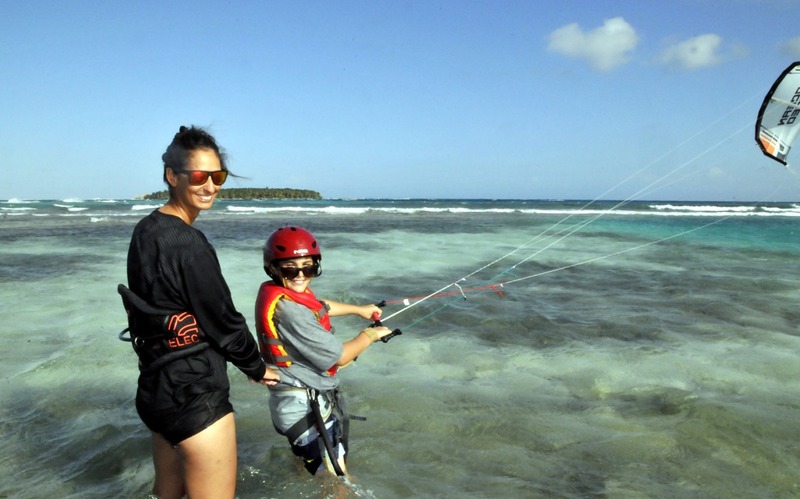 We access our sand flates via motor raft to nearby sand flats where there is no coral, nor any other obstructions, and there students can begin to learn the real fundamentals of kitesurfing with larger, more powerful kites under the care of our certified kite instructor. Our teaching location is unique and guarantees a fast learning curve. 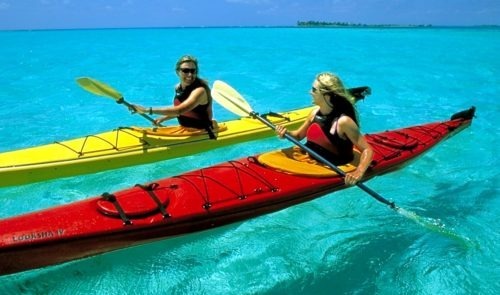 Our incredible sand flats allow for uninterrupted practice, typically 2 miles downwind. This allows for continuous skills development throughout the lesson. In other locations a considerable amount of any lesson is spent making your way upwind or returning back upwind in-between body dragging. This is simply not necessary at Glover’s which allows for accelerated learning and quick progression through skills. Lesson progress is tailored to the individuals and low ratio instructor: student lessons allow students to progress at a speed with which are comfortable and confident. What if I don’t need lessons? 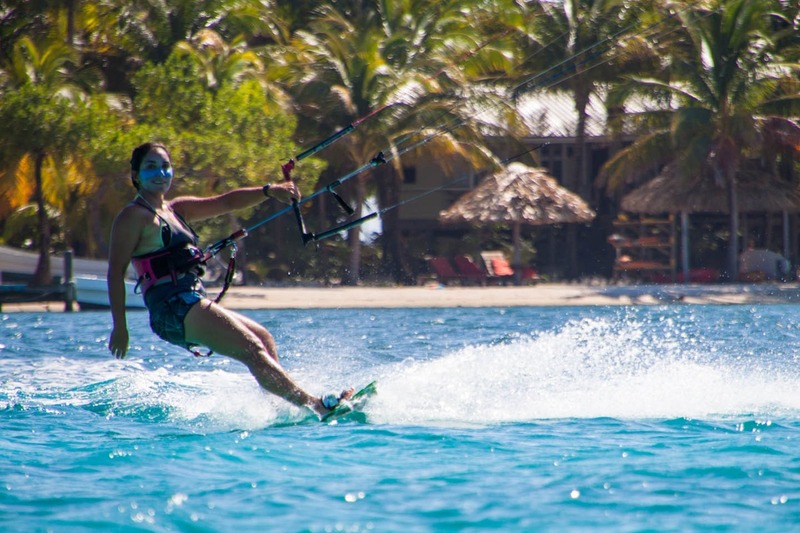 Advanced kiteboarders will want to experience the excellent Belize kitesurfing conditions at our location (see Belize Kiteboarding for further details). 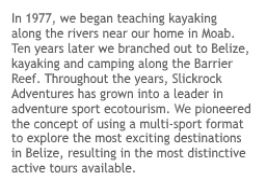 As an approved Vela center, Slickrock maintains a selection of late model equipment for our guests. 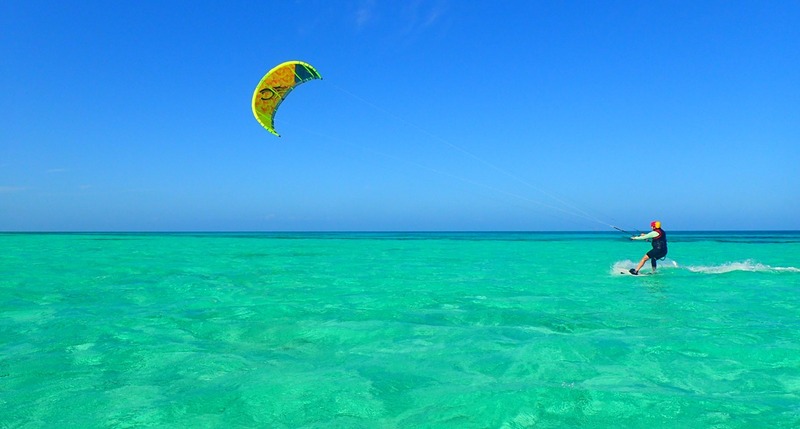 Kiteboarders who wish to kitesurf on their own should bring their own kites and all other gear. Slickrock provides boards at no charge so guests will not have to deal with transporting them. None of our kites, lines, or harnesses are available to rent. Our minimum age for kitesurfing on the island is 12. We require anyone taking kitesurf lessons be at least 100 pounds and 5 feet tall, for it is essential that youths be of a reasonable size, weight, and strength to manage the equipment and be able to stand in one spot without floating away. They also must be reasonably athletic. A kitesurf student must possess a mature outlook and be capable of maintaining the focus needed to manage powerful equipment. Therefore for all kids between the ages of 12 and 15, the final decision rests with the instructor, who will take the youth on a trainer kite session first. Only then will they be able to make the decision if they are ready to advance to a full, adult lesson. It may be possible to take somewhat younger children under perfect conditions with a parent along to assist on a single-student lesson. This is up to the kitesurf instructor on site, and cannot be figured out in advance.